At 12:00 on September 1, 2015, they start selling the Champions League packages for the Champions League group stage games, which will be held at the Arena Lviv in Lviv. By purchasing a Champions League package, you save time and money, receiving a permanent seat in the stadium for all three matches, as well as the opportunity to buy a parking space for your car. We bring to your attention the prices and sales stages. Please note: one individual can purchase no more than 2 Champions League packages! • Stage 1 (01-07.09.2015). Selling the UCL packages (a UCL package comprises three individual tickets for each home game) to the registered fans. The first stage is divided into four periods. - 01.09 - selling the UCL packages to holders of the Arena Lviv fan cards and fans who have attended the UL games in the current season 2015/16. - 02-03.09 - selling the UCL packages to fans who have attended the UL games in the 2014/15 season. 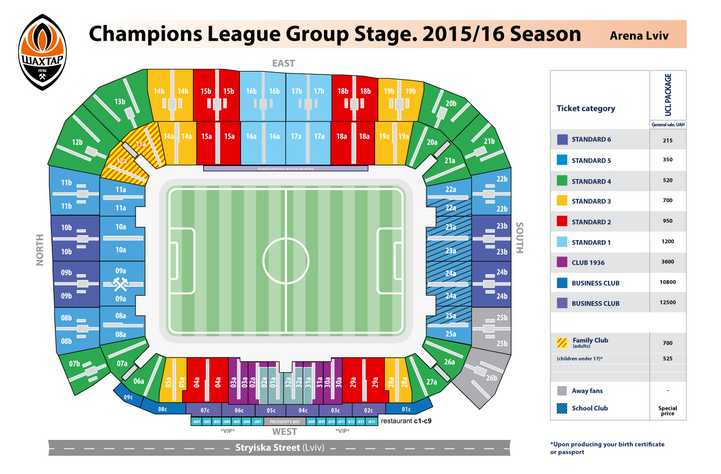 - 04-05.09 - selling the UCL packages to fans who have attended the UCL games in the current season 2015/16. - 06-07.09 - selling the UCL packages to fans who have attended the UCL games in the 2014/15 season. they should produce their ID document and show the SMS code at the Arena Lviv ticket office. • Stage 2 (from 08/09/2015 on). General sale of the Champions League packages at the Arena Lviv ticket office and online at tickets.shakhtar.com. At the ticket office, a fan will be required to produce his ID, fill in the fan form and buy a package. In the event of some seats remaining vacant at the stadium, the corresponding tickets will be put for sale. Their aggregate price for 3 matches will be much higher than that of one Champions League package. We will announce the third potential stage additionally. Attention! Holders of the Donbass Arena season tickets for the recent 6 seasons, can buy one Champions League package of any category at 30% off and one additional package at the general sale price. In order to do so, a fan should email the series and the number of his/her season ticket (if you cannot send us the series and number of your season ticket, it will be sufficient for you to specify and email to us your surname, first name and middle name, the season for which you had a season ticket and your mobile number) to zayavka@shakhtar.com or contact the call centre at (062) 388 88 83. Holders of the season tickets to Club 1936, Business Club and Diamond Club can call us via a dedicated line (067) 620 14 59 or (050) 420 20 17. We will book the Champions League packages for you. You can pick them up at the ticket office of Arena Lviv daily from 10:00 until 20:00 and on the match day from 10:00 until 17:00. Make sure to have your ID on you. Business Club: UAH 10,300 and 12,500. Ticket office od the Arena Lviv stadium is open daily from 10:00 til 20:00 without breaks. On holidays and weekends, the opening hours remain the same! For more information, please contact the Arena Lviv information centre at (067) 622 38 88.